The Ad-Hoc sketchers met at the Arboretum last Friday. Yes, rain was predicted, and yes, I did get a few drops on me, but I was sitting under a rather dense tree, near its thick trunk, so I was protected. 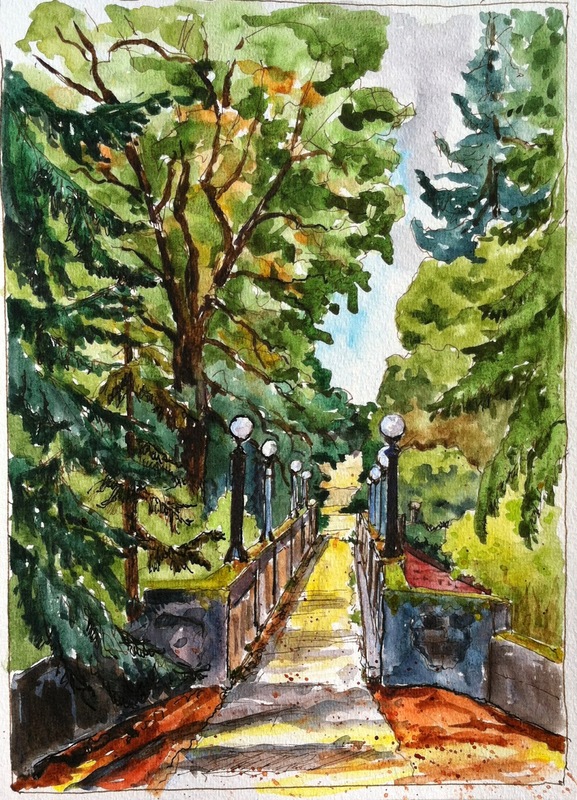 Since I have already sketched the view of the old bridge/walkway from below, on Lake Washington Blvd, I decided to sketch that classic view from above, where the bridge becomes a walkway from the main part of the park over to the much smaller strip of park west of the boulevard. Having been one who has created large fully finished watercolor landscapes for 45 years, I still find it very difficult to break that practice...Nevertheless, I keep trying to do those "quick sketches." Beautiful rich colors, Peggy. Love the contrasting greens and indian red. I agree with Jane, love the bold colors and contrast. Nice!